Red lenses with a wavelength range of 620-750 nm are used to target predatory animals while hunting after sunset. For nocturnal creatures, the light beam is virtually undetectable, which gives hunters more time to setup a shot while targeting the animal. When the red light hits the retina of the creature, the reflection initiates a surreal glow. This allows an individual to track the animal under nighttime conditions, where natural, background lighting may not be available. Additionally, because red light beams are softer (compared to white light and other bright color tones), animals are less offended or threatened by the light. This practice places great emphasis on the color of the light being used during application. However, the choice of color may not be as effective as the actual technique being implemented (more on this later). Traditionally, green light is applied in hunting areas where domesticated animals are present, such as private farms. The application of green light makes it easier to spot dark-colored feral pigs, which is why some hunters carry a spare green lens in their kit. White light is not typically used for nighttime hunting, because it often results in spooking or shock. The use of bright, white beams also affects a human’s peripheral vision during hunting, and may generate distracting shadows around the area. When an individual is exposed to white light in a dark environment, it becomes harder to see objects in detail. Some people have reported blind spots, or the presence of lingering shadows after direct exposure from white light. The color of the hunting lens may ultimately come down to the personal preference of the individual. Contrary to popular belief, nocturnal creatures, such as wild pigs, boars and coyotes, are able to perceive red light. Pigs support dichromatic vision capabilities with two pigment cones that help create accurate color depictions. Although the animal’s ability to perceive color is not as sharp, compared to a human, it can (at the very least) see the light beam coming from the portable luminary during application. If you’re wondering why an animal gets spooked by the “invisible” red light, it is simply because it can see the beam. In order to prevent such occurrences from happening, it might be worth checking on the preferred color of light hunters are using in your area, and avoid using the colored lens (if everyone on the field is using a red lens, try using a green one and vice versa). Chances are, most of the creatures are already accustomed to seeing red lights; and the animals would be caught off guard with the use of other colors. To prevent spooking, one should also use the right level of intensity when flashing the light around the field or directly at the target. For example, if the animal is 100 yards or closer, using a megawatt spotlight for illumination might be an overkill. Since the light’s main use is to passively highlight the target for an accurate shot, an excessively bright light is not needed. Using an overly bright spotlight setting may also drain your battery and increase the likelihood of running out of power prematurely. Lastly, while flashing the light over a wide area, it is important to keep the light moving. Don’t shine the light beam for a long period of time over the creature’s eyes until you’ve confirmed the authenticity of the target (it’s a nocturnal animal, not a human). Instead, leave the edge of the beam close to the eyes of the animal to keep track of it while lining up your shot. Only shine the light directly at the creature when you’re ready to pull the trigger. This method is easier to implement using a handheld spotlight (using a headlamp may hinder one’s ability to use the scope when controlling the beam of the light). For best results, it is recommended to leave the light on while scanning and targeting. Persistent toggling may throw off one’s cover and alarm nearby animals. 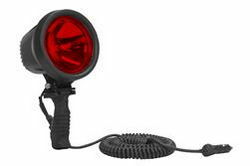 As mentioned earlier, the brightest, sharpest red spotlight may not always be the best option for one’s hunting needs. When choosing a robust hunting light, an individual must ensure that light does not spill out of the seals, cracks and housing of the unit. This could result in unwanted light leakage when walking around the field. Ideally, a spotlight that offers interchangeable colored lens is also more practical than carrying around multiple, colored spotlights. The operation time of the hunting light should also be taken into consideration. Most handheld spotlights offer at least 2.5 hours of runtime. One would simply need to carry around batteries or rechargeable power supplies to keep the units going throughout the excursion. Going back to the type of light beam, because nocturnal hunting often involves long ranges (rarely does a hunter shoot an animal in point blank range), one must invest in spotlights that provides focused beams. Scattered, overly bright light may scare away nearby animals around the field and give away the hunter’s location. Most experienced hunters aim for a minimum beam range of 300 feet.